Last Friday was Dave's 29th Birthday...his last hurrah before the big 3-0. Jenna, as usual, woke up early enough to see him before he left for work and even remembered to say Happy Birthday to him complete with a huge hug, I think that got his day off to a good start. She worked really hard on making him a birthday card complete with pipe cleaner for hair. She couldn't wait for him to get home so she could give him his present. She doesn't think it's all that fair that whenever we ride bike she is the only one that has a helmet on. So as we walked through Walmart a couple weeks ago she spied the bikes and we stopped to look. Then she saw the rack of helmets and said "mommy, I think we should get Dave a helmet for his birthday". 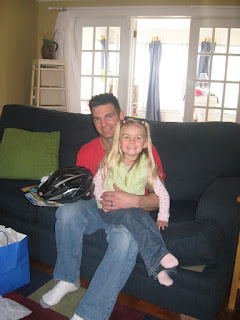 We had been talking about what to get him and no other ideas had surfaced so she picked out a helmet. At least she knows he likes black and went with something not too flashy. I don't know that Dave loves the idea of wearing a helmet but he couldn't help but smile knowing she was so proud of her gift for him. Sunday we celebrated Easter by attending church and then headed off to family dinner with the Wolters side and then to my moms later in the afternoon. 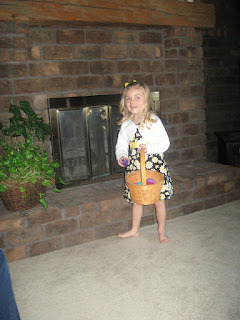 Ever spring Jenna receives an "Easter outfit" from her Nana (her dad's mom). 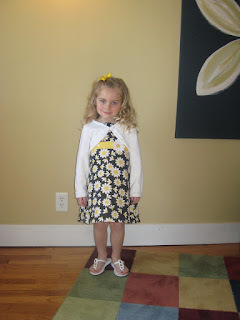 I know how much fun nana has picking out the outfit and each year they are very cute. This dress has a matching hat as well but Jenna wasn't into wearing it Sunday....just to the grocery store and all around the house for the past week. Here she is looking so grown up to me! My mom had a little Easter egg hunt for the girls which consisted of Jenna finding all the eggs and Allee with the basket once Jenna had filled it up. 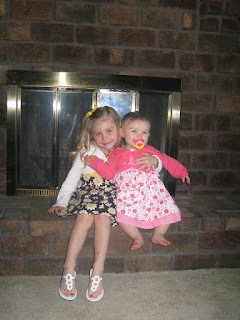 Jenna and her Allee-Ballee as she affectionately calls her. You can tell how much Jenna adores Allee and I think Allee is gowing pretty fond of Jenna too as she is always full of smiles when she sees Jenna. Counting down the days until our ultrasound and leaving for Florida....Thursday should be a great day! I'm so jealous of you! When do you get back? Are you guys flying? We are driving, leaving Thursday night and coming back the following Saturday. We hope to drive straight through. It gets really expensive to fly when you have to pay for a kids ticket and then rent a car when you get there! Thanks for leaving us some sun! I checked the weather and it looks like it should be nice!!! I'm hoping to tan this belly of mine and do some serious relaxing.